For other people named John Cannon, see John Cannon (disambiguation). John "Ace" Cannon (May 5, 1934 – December 6, 2018) was an American tenor and alto saxophonist. He played and toured with Hi Records stablemate Bill Black's Combo, and started a solo career with his record "Tuff" in 1961, using the Black combo as his backing group. "Tuff" hit #17 on the U.S. Billboard Hot 100 in 1962, and the follow-up single "Blues (Stay Away from Me)" hit #36 that same year. In April 1965, he released Ace Cannon Live (HL 12025); according to the liner notes by Nick Pesce the album was recorded in front of a live audience inside Hi's recording studio, and Pesce claims this was the first time such an album had ever been recorded (as opposed to previous live albums recorded in concert venues). Cannon was inducted into both the Rock and Soul Hall of Fame and the Rockabilly Hall of Fame in 2000. 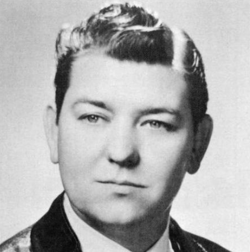 In May 2007, his hometown of Calhoun City, Mississippi, hosted its first annual Ace Cannon Festival, and on December 9, 2008, he was honored with induction into the Mississippi Musicians' Hall of Fame. After years of traveling and entertaining fans the world over, he moved back to Calhoun City in the late 1980s, where he resided until his passing. He played numerous dates each year, and would be found most days working on his golf game at his home course. He died at his home on December 6, 2018, at the age of 84. 1972 - Cannon Country - Ace, That is! ^ a b "John Henry "ACE" Cannon May 05, 1934 - December 06, 2018". obittree.com. Retrieved December 14, 2018. ^ "Billboard Hot 100 - Ace Cannon". Retrieved July 2, 2017. ^ "RAB Hall of Fame: Ace Cannon". Rockabillyhall.com. Retrieved 2014-08-20. ^ "Mississippi Musicians' Hall of Fame". Retrieved July 4, 2017. ^ "Ace Cannon". Calhoun County Journal. Retrieved 6 December 2018. This page was last edited on 8 March 2019, at 07:30 (UTC).